That’s going to be it now. I’ve made the dough rectangle as long and narrow as my worktop will allow, so, without extending the kitchen, I’m stuck. Doh! The ‘tube’ is too thick again – not enough revolutions! There’ll be too much bread to jam, per portion. Smells good - nice and puffy. 3. 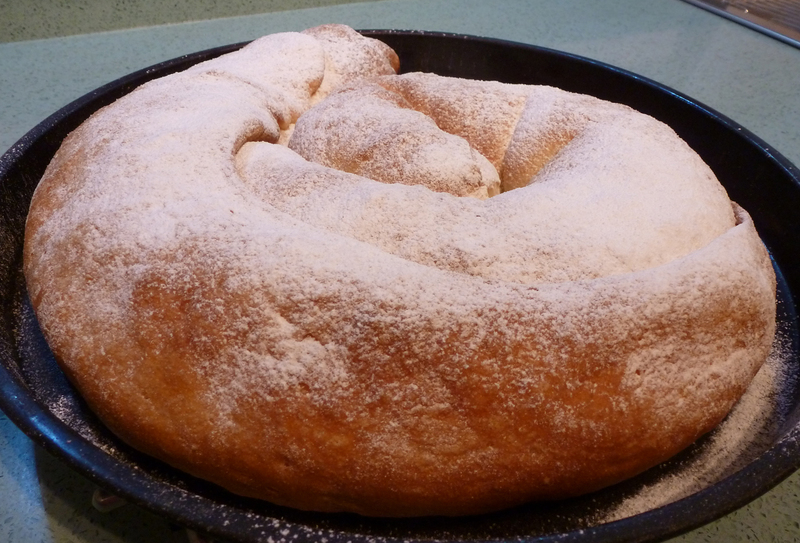 Not too brown (always a problem – the dough is rich with egg and sugar, and darkens within minutes). I wonder if it’s cooked through? Won’t know till we cut into it tonight at our Halloween canasta party. A title that won’t mean anything to many! Ensimaida. I’ve been struggling to make an ‘Ensimaida’ for a long time. 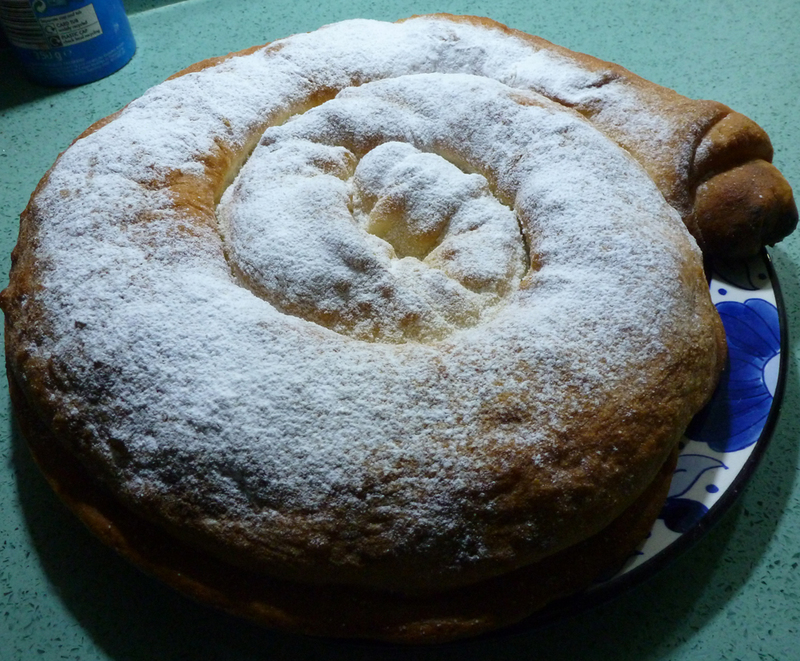 It’s a delicious Spanish pastry that, I know, from Mallorca. A coil of rich, buttery yeast pastry filled with a tasty, fibrous golden goo. After many years of the enduring mystery, daughter found out that the filling is pumpkin jam, called ‘Cabello de angel’ (angel hair). She made me some delicious jam with her pumpkins, and I started the quest for the perfect ensaimada. Second attempt. Jam boiled out the ends of the coil, ran about all over the place and caramelised to a unattractive black crust! (I now make a big fuss of folding the ends over and sealing the jammy goodness in). Third attempt. When you use ‘Google translate’ on the Spanish web pages for this recipe, it says you should keep it in a ‘locked cupboard’ to rise! Well, my ‘locked cupboard’ was too hot. I killed the yeast, and ended up with a crunchy, jam-filled drain-pipe. At the point, I ran out of pumpkin jam, and gave up trying to make ensaimadas. 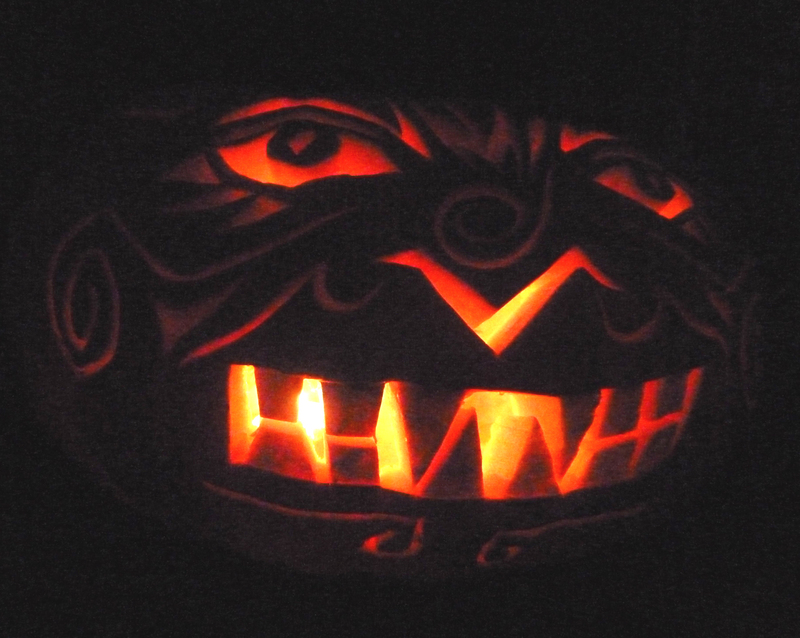 However, now I have a fresh supply of pumpkin jam, (and the Halloween pumpkin head), and I’m ready to try again! Dough is now ready for manipulation…. I’ll keep you posted. Brixham Fishstock this weekend. A celebration of all things fishy, with music. The daughter and son-in-law are coming down, so I’m busy cooking up a few things, including Chocolate Pear Cake, which uses some of the pears I bottled last week (one bottle down, 24 to go). Son-in-law loves chocolate, so any visit is preceded by a chocolate-based frenzy in the kitchen, and much hurrumphing from hubby, who tries to claim that HE never gets this much attention (course he does). 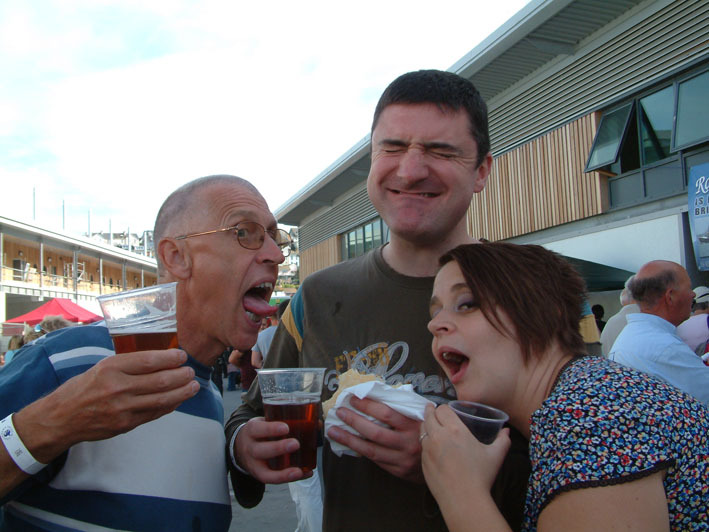 Son-in-law suffering a food and beer mugging by team Squires. We’re sad that Mad Dog McRea isn’t appearing this year, but Fisherman’s Friends should be good. I hope the Polynesian dancers will be performing again this year. They wiggle those grass skirts so fast! I’ve discovered that the secret is to quickly flex your knees in a back and forth motion, then your hips naturally follow. Perhaps I can audition to join the troop this year? I’ve noticed that although the main guys are Polynesian, the large troupe of lady backing dancers look like they come from Torquay. I’m sure I would be an asset, albeit a large one. ‘Why do your bottles have too much airspace at the top?’ says hubby. ‘I don’t know. It doesn’t seem to matter,’ say I. ‘Why don’t you process them in the pressure cooker, then open them up and add some more liquid?’ says hubby. ‘Because that’s NOT how preserving is supposed to be done!’ snap I. ‘You don’t understand the preserving process! You’re supposed to seal it, then sterilize it all thoroughly by heating it, then let it cool, SEALED, so no contaminants can get in.’ Grump grump. ‘You did WHAT? !’ shouts hubby, with some alarm. ‘Don’t you understand the heating process? Things get BIGGER! You’ve probably cracked all your bottles because the pressure would build up too high inside them,’ grumps hubby. ‘No – I heated the bottles, lids and all the contents, so everything was as big as it was ever going to get,’ I replied, with a somewhat wavering conviction. Sometime later – I slipped the top off the pressure cooker, with trepidation. Yeah! I was right! All is well. Everything has to be really hot before you start processing with the pressure cooker, and I’m now working my way through bottling the huge sack of pears we picked from our dinky little pear tree. 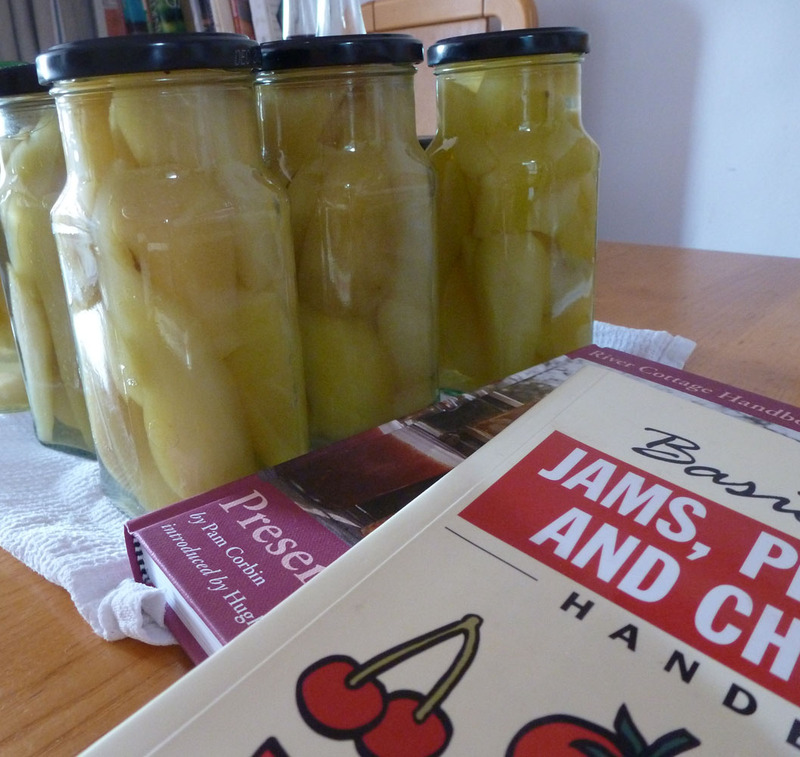 Bottled pears and a couple of my preserving 'bibles' - 'Jams, Preserves and Chutneys' by Marguerite Patten, and The River Cottage Handbook, 'Preserves' by Pam Corbin. Can sauerkraut be ‘off’? How can you tell? I’ve got a crock full of it here. It’s a strange concept – I suppose it’s ‘off’ to start with. After all, it’s just a bucketful of festering cabbage. I need to examine some further concepts, such as ‘how can you tell if Stilton cheese is moldy?’, and ‘Gravadlax… mmm, tasty buried fish’. Best bit of the year is upon me. Time to gather courgettes and French beans by the bucketful. I love the way you never know how many you are going to get. If you plant a cabbage, you know you’re going to get just one cabbage. Planting a courgette plant, you could have one or dozens (usually dozens!). The only problem is that hubby only likes a couple of courgette recipes. One is battered and deep fried, with a crispy batter full of fresh curry spices. The other is fried with bacon and onion. That leaves quite a few kilos of courgettes unaccounted for. Then, why do so many French beans come at once? I’ve tried freezing them but I don’t like the watery result. I can’t bear to throw anything away, so I’ve devised a few recipes for preserving them so we can eat them through the lean winter months. These have been evolved from the wonderful Margeurite Patten’s book of ‘Jams, preserves and chutneys’. Dhansak sauce and Greek Beans, awaiting their labels. This can be a dangerous operation because of the enzymes in vegetables and the lack of acidity, so you must ensure that the jars are pressure cooked (gently) for 40 minutes, no less. Fruits, including tomatoes, can be sterilised in much less time, but vegetables must go through the full process. You’ll notice I’m not using posh Kilner jars. Firstly, they’re expensive. Secondly, the stoopid things are the wrong size to fit in my pressure cooker! 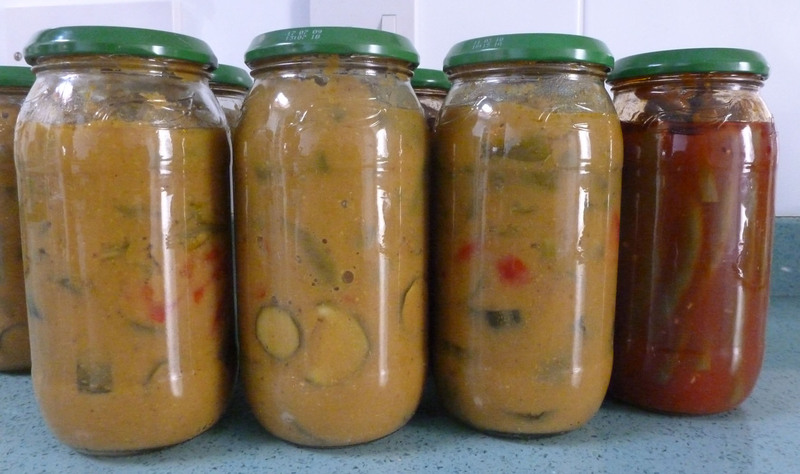 Amazingly, recycled ‘cook-in’ sauce jars work just great. I’ve looked into buying new ones on the internet, but they are colossally expensive if you want less than 30,000, and I can’t find the all-important tops with the safety buttons. I did experiment with some VERY cheap jars last year, when our Sainsbury’s was offering it’s ‘Basic’ curry sauce for a staggering 4p a jar. (We actually ate the sauces, though my original thought was to throw them away and just use the jars. Not bad….) It didn’t work too well because the jars and lids were flimsy, and I didn’t have a great rate of lids sealing properly. Slightly acidic sauces work best, hence the tomato in the beans. The curry sauces are good with the addition of lime or lemon juices, and tamarind seems to have enough natural acidity to help out. I was experimental last year, and had a couple of disasters. I made a curry sauce with a cashew nut paste in the sauce. Delicious when made fresh, but cashew nuts really don’t like being tortured in a pressure cooker for 40 minutes. The result was a bitter mess. The aubergines stuffed with coconut, peanuts and spices and cooked in a tamarind sauce taste good, but look like bottled poo, so I won’t be doing them again. 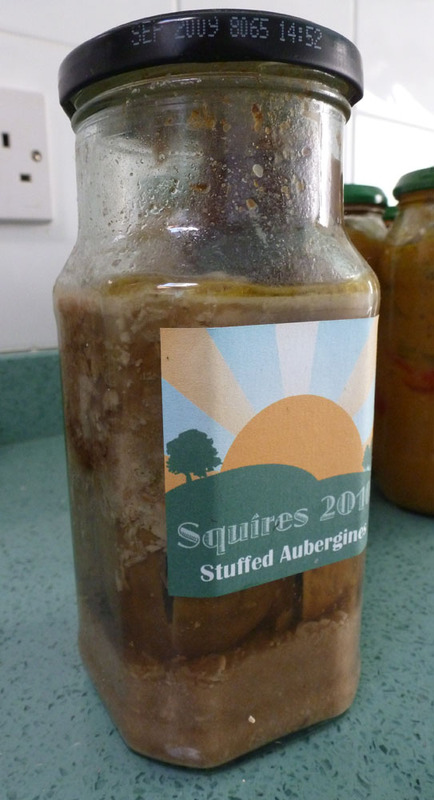 Bottled, stuffed aubergine - tastes great, looks like sewage. Please excuse the haphazard nature of quantities in these recipes. It’s a question of eyeing up how many veg you have available and how many bottles you think they’ll go into! Greek Beans – so called because they are based on beans I remember eating in Corfu on one of my first holidays abroad. They were meltingly tender, heavy with garlic and oil, and some tomato. This is one of those recipes that probably tastes nothing like the original, but has been filtered through my memory banks and has popped out like this. Vegetable dhansak. When you want a curry in a hurry, fry some meat in spices, cook until tender and then add this sauce for the last ten minutes. You’ll notice there’s a lot of spices in the sauce itself. It needs to be tasty and pungent to because all the vegetables will absorb the flavour. Also, the preserving process itself seems to quieten down the flavour, so you need to make it really zing.